And is it time for a new pair of pants? I recently played The Visitor in VR. In front of an audience of drunken friends egging on my high pitch outbursts. I lasted seven out of the ten minutes, finally succumbing after a close encounter with a pixelated pillow. The Visitor's story is about an unexpected guest calling to your house in the middle of the night. 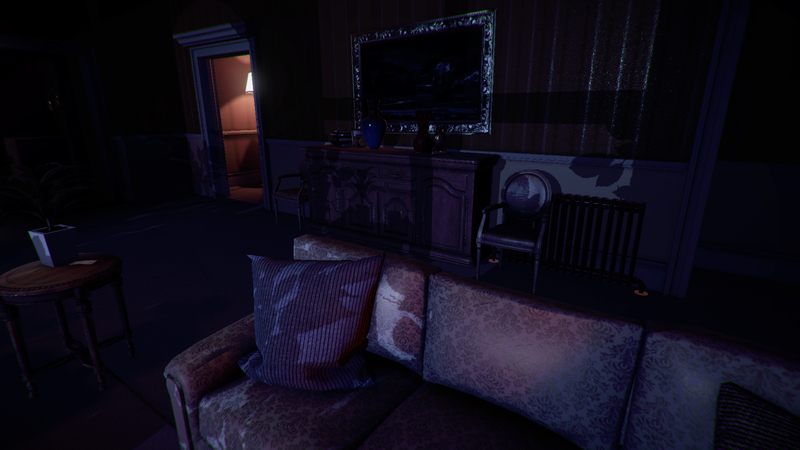 Developed by NostalgicBear VR for the Oculus Rift and HTC Vive it relies on atmosphere to unsettle players, using visual cues in the form of intermittent flickering lights to inform the player where to look. Paralysed and lying in bed, you can only wait and watch as the strange occurrences culminate in one of the biggest jump scares I've ever experienced. As virtual reality goes, this particular experience has a high creep factor. It's one of those new VR 'games' that really should come with a free pair of pants. This week I certainly won't have been the only one jumping out of my skin. In the wake of the PlayStation VR release, headed up by the dark and psychological Here They Lie, pretty much every major gaming outlet slashed their prices on horror games and gamers all over the world have been celebrating Halloween with their first exposure to a virtual reality freak out. Professor Tanya Krzywinska, director of the The Games Academy at Falmouth University, tells me that VR is the next natural step for one of gaming's most popular genres. Horror made its way into video games very early on and Krzywinska cites the 1995 point and click Phantasmagoria as an early breakthrough game due to its use of video snippets to show a 'real' actress reacting to the horrific events as they unfolded around her. She also mentions Silent Hill as a game-changer for its use of sound and its surreal "Twin Peak-ish twist" on survival horror. "Both these games utilise a particular emotional palette that I regard as central to games: a sense of claustrophobia and the sense of being unable to act effectively on a situation," she says. "VR can make very good use of this palette because of its immersive nature and I think horror is one of the few genres that VR really suits." But just how big of a game changer is the introduction of VR for the horror genre? Sergio Hidalgo, an independent games developer, created one of the first polished horror experiences on the Oculus Rift and Samsung Gear VR: Dreadhalls a creepy dungeon crawler largely respected as one of the best VR horror experiences available. "VR can work as an immersion multiplier, and given that the horror genre is built on immersion, it simply opens more opportunities to create experiences that take advantage of that sense of physicality it can provide," Hidalgo says, explaining how simply being in a scary environment can be a very engaging experience in VR on its own. "This was already true when I started Dreadhalls but the technology keeps moving forward and improving with new developments such as room scale or motion tracked controllers." With new tech comes new challenges and not just for developers, for players too. I very much doubt that coming across some dastardly duck down bedware in Resident Evil would have me screeching like a pig. Yet VR grips the gamer with such a suspension of disbelief; when the headset is on there is seemingly no escape. Do developers take into account the psychological differences between previous gaming horror experiences and that of VR? Ben Tester is one of the developers of Don't Knock Twice, a VR horror experience scheduled for release in 2017. He says developers are in a strange predicament where it's now possible to make a game that's too scary. For that reason, Don't Knock Twice includes traditional adventure gameplay elements, such as puzzle solving and environmental props, to aid storytelling and remind the player every once in a while that they are still playing a game. "We want to make a great horror game that people will remember for sure but we don't want to make it so uncomfortable that it makes it unplayable," Tester explains. "In Don't Knock Twice, we want to avoid the player going through a constant stream of scares one after another and instead, create an interesting and atmospheric environment which will creep out any horror enthusiast. It's about finding the right balance between having a solid gaming experience and immersing the player in a terrifying horror situation." Such immersion comes with benefits. In the VR demo of Don't Knock Twice, players can break down a door with an axe. As Tester reveals, this often leads to them leaning their heads forward and triggering the classic "Here's Johnny" moment, which only amplifies the jump scare which follows. "A scare that wouldn't have been half as effective if it was in traditional gaming style," he admits. Hidalgo agrees that there's a special kind of excitement that comes from building a place where players are "transported to an experience as 'real' in a deeper sense than in a traditional monitor." For example, in Dreadhalls there are monsters that react to the player's gaze direction, forcing the player to either not look at them directly or the opposite. "This is a much richer interaction when the player is performing it herself rather than via a mouse or controller," he says, adding that Dreadhalls would never have gathered such attention if it weren't for the new types of interactions and features made possible by VR tech. With virtual reality still relatively new for mainstream gamers, it seems unlikely that developers will be entirely certain of the effects of these new interactions. Are there dangers in breaking the fourth wall when it comes to horror experiences? Is it possible that VR is just a bit too 'real'? Professor Mark Griffiths, a chartered psychologist and director of the International Gaming Research Unit at Nottingham Trent University, explained that, while VR is certainly more immersive than usual, we should remember that immersion can occur even without being in an VR environment. A good example is first-person-shooters. "For most people there's not going to be a problem. Those that already enjoy watching horror films, the vast majority will probably love it even more in VR and it's not going to have a negative impact on them," says Griffiths. "I would be fine in an immersive horror with someone being disembowelled in front of me, because I like gore. It's not going to turn me into something bad. But you always get a small minority of individuals that it may negatively affect either psychologically or traumatically. Overall though I don't have massive concerns about this until scientific evidence proves otherwise." Context is key. After all, we all react to horror in different ways. On the same evening that I was petrified by a pixelated duck down pillow, another one of my mates was quite happy to confront a creepy looking doll head on, literally laughing in the face of fear. That said, will producers of horror content for VR have to consider new ethics when utilising the immersive medium because of the way in which our mind and bodies digest the experience? Krzywinska says what's important is finding the right balance between pushing the boundaries and taking stock. "Horror is very inclined to want to take advantage of new formats to refresh the palette and work with the cache that the novelty provides," she says. "Without that novelty, repetition occurs and you then only manage to engage younger audiences who haven't been around the horror block. Horror is a very suitable place to take a good, long, critical look at ethics and I hope that some game designers see that." Indeed, the developers I spoke with are well aware of the potential morphing of ethics and are fully engaged with the notion that everything is changeable. "The main ethical recommendation I have in this regard is that of not betraying the player's trust," Hidalgo says. "When the player enters a VR experience and surrenders control over their senses to the developer, it's important that she's aware of exactly what to expect, and that this promise isn't broken by the developer. But which is best for VR? "It's very different to have a jump scare in a horror game that advertises itself as such and has been building tension for several minutes before the event, than in an otherwise non-horror experience, where the jump scare comes out of the blue and breaches the promises made to the player in regards of the tone and intensity of the experience. I'd relate it to the haunted house example. Properly behaved attractions always operate under strict boundaries, never to touch the public for instance, that are communicated ahead of time." And as for those, like me, who are still scared witless, Professor Griffiths has the solution: "Just shut your eyes."